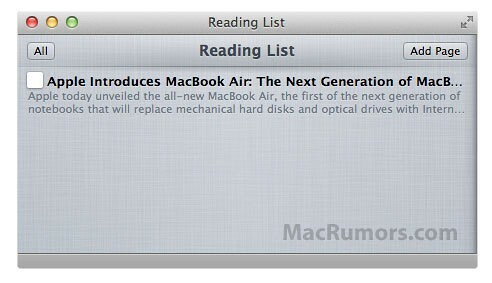 MacRumors found an interesting new feature in the latest Mac OS X Lion builds called the Safari Reading List. Reading List is a feature akin to services like Instapaper, and allows you to save webpages “to read later”. The feature is not fully activated in Lion Safari, but the application’s help menu breaks it down. To open up your reading list, simply click the reading glasses icon next to the bookmarks icon (not yet visible in Lion). You can also view saved links/articles in “reader mode” – a feature that debuted with Safari 5 last year.